Linné on line – How many different forces are there? Linné on line Physics and the Cosmos Physics and the Cosmos Quarks and leptons How many different forces are there? Beta-decay of a down quark. Beta-decay of the neutron is one example of the weak interaction. On the elementary particle level a down quark in the neutron decays into an up quark, an electron and an electron-neutrino. There are two types of weak interactions. Beta-decay is an example of the so called charged current where an electrically charged W-boson (with electric charge +1 or -1) is exchanged. The other type of weak interaction, called neutral current, is similar to the electromagnetic interaction. In this case the exchanged particle is the electrically neutral Z-boson. The electroweak bosons W and Z were discovered in 1983 at CERN outside Geneva and the discovery was awarded with the 1984 Nobel Prize. 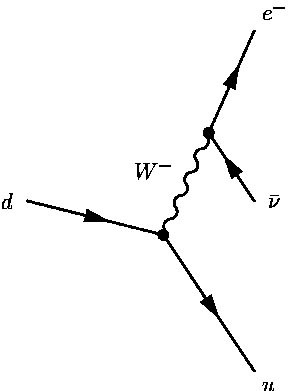 The reason that the weak force is much weaker than the electromagnetic one is that the W and Z bosons are so heavy. Their masses are about 80 and 90 times heavier than the proton, respectively. Due to the large mass the weak interaction has a very short range. In fact the electromagnetic and weak forces can be described in a unified theory called the electroweak theory. There is a hope that one should also be able to describe the other forces in a so called grand unified theory. However, such a theory is only applicable at extremely high energies which existed at the creation of the Universe, the Big Bang. Picture from the SPS tunnel. 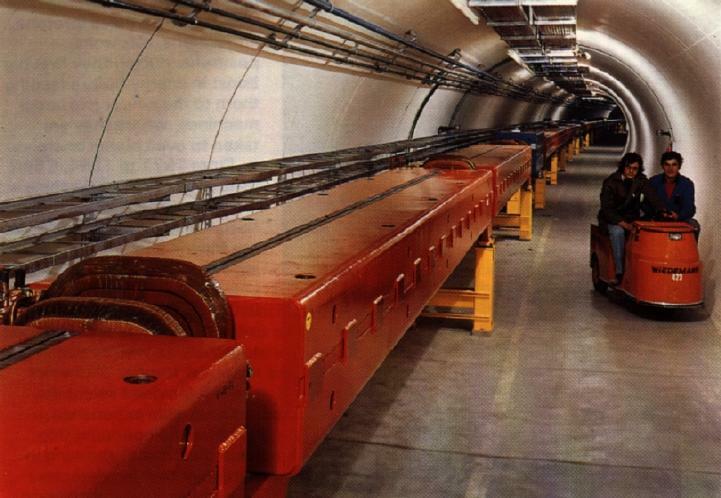 The discovery of the heavy electroweak bosons was made by the so called UA1 and UA2 experiments at the SPS collider (Super Proton Synchrotron) at CERN. 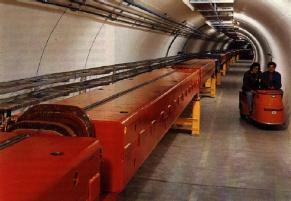 There, protons and anti-protons where collided at such a high energy that the heavy bosons could be created. However, the identification of these bosons was not so simple, since they where very seldom produced in the collisions and they had to be distinguished from a large background of other collisions.